The 1910 tower, from the Weeks Mills Waterworks, will be part of the Windsor Historical Society exhibits at the fair. WINDSOR — Avery Glidden’s crane made short work of lifting the 60-foot-tall windmill tower and placing it in its new home Saturday in the section of the Windsor Fairgrounds occupied by the Windsor Historical Society buildings. But reassembling the tower and digging the pits to encase the legs took a lot longer and installation of the blades and a new gearbox will have to wait until next year. In the meantime, however, Windsor Fair goers and others can see a part of the 1910 water works that once supplied water to a dozen homes in the village of Weeks Mills. The Windsor Fair runs Aug. 27-Sept. 4 this year. On Saturday morning, about 20 people, volunteers, members of the Windsor Historical Society and friends, watched the placement of the tower, which resembles a life-size erector set. Kurtis Biggs, of Augusta, scrambled in and out of the four pits encasing the legs to secure the feet to sunken concrete pads and later climbed the tower to make final adjustments. He volunteered his time to assemble the tower, noting that some pieces needed to be replaced and some of the rods unknotted. He credited Robert Brann, president of the historical society, with being the mastermind behind the project. 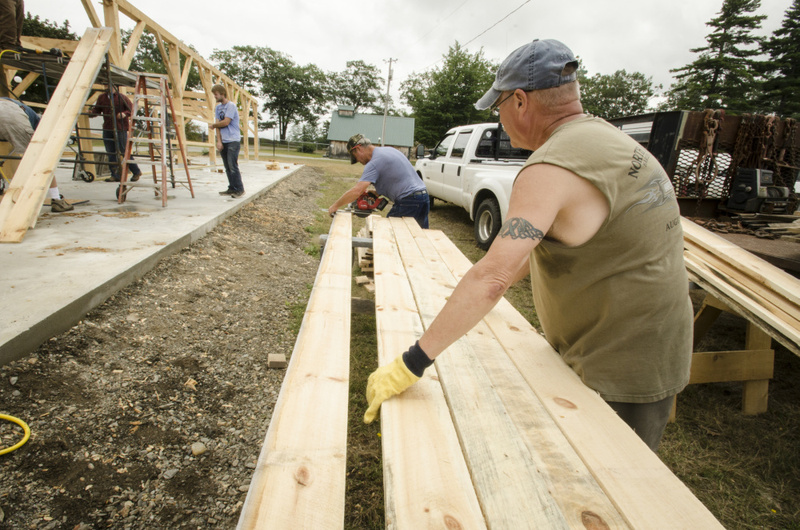 Brann said earlier that volunteers spent much of the summer on the project. The windmill was used to pump water into a reservoir and then it was gravity-fed to the homes. She recalled trying to climb the tower when she was younger. “I didn’t go far,” she said. “My brother would go way up and scare me to death to see what he could see.” The windmill from the Weeks Mills Waterworks was donated to the society by Don Bassett. He said ownership had been transferred to him in 1979, and he had taken it apart because it had been damaged by lightning strikes. 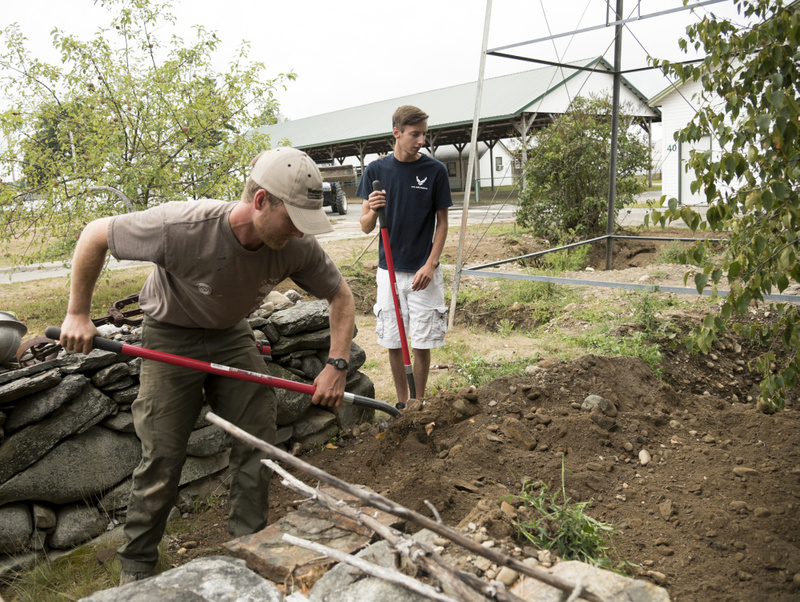 “It was looking for a good home,” Bassett said, as he watched the placement Satuday morning near side Gate 4. He credited Biggs and others for resassembling it. “The water tank that stores the water is still in the village and still in use today,” he said. But the power for the pump now comes from a gasoline engine, not a windmill. Bassett said etching on one of the legs indicates the tower was sent to a Mr. Massey, who developed the water system. “It came on the WW&F (Wiscasset, Waterville and Farmington) Railway,” Bassett said, giving the colloquial translation as “Weak, Wobbly and Frail,” and noting that it was a narrow gauge railway. Bassett said he initially acquired the windmill thinking he would put it up on his farm, but family and other demands left him without the time to do it. Bassett is a member of the Windsor Historical Society and volunteers as a printer in the museum on the grounds. He said the society would be seeking to raise money to fund the purchase of some missing parts for the windmill. As Bassett talked, a camera-toting drone flew atop the scene, hovering occasionally to capture the action below and then darting over to where a half dozen men were worked on the framing of a long, narrow building. Spencer Martin, 11, of New York City operated the drone from the passenger seat of his parents’ truck. The raising of the tower piqued his interest as well, and he said he planned to put up a video about the installation on the society’s Facebook page. At the sawmill construction site, Bill Forbes said the finished mill would be 96 feet by 24 feet. 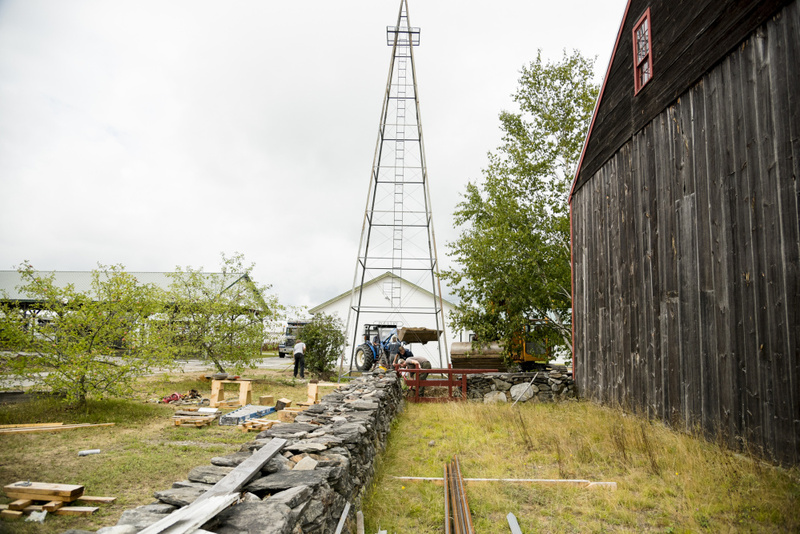 On Saturday, 8-by-8 posts were in place, and the sawmill itself, manufactured by T. H. Ricker and Sons of Harrison, Maine, lay nearby inside a barn. 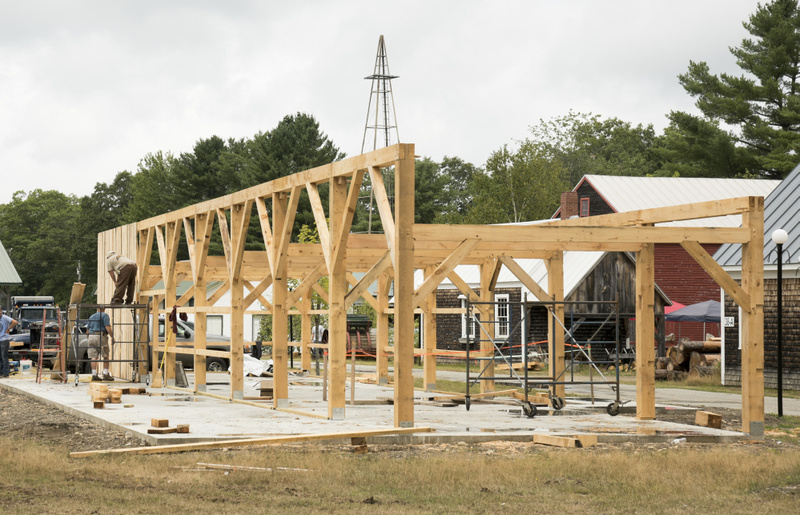 Forbes said construction on the building will go on hiatus during the fair, but once the mill is in place, it will be operational and used to cut lumber for vaious projects. “I can’t wait ’til it gets running,” he said, anticipating completion by the 2018 fair season.